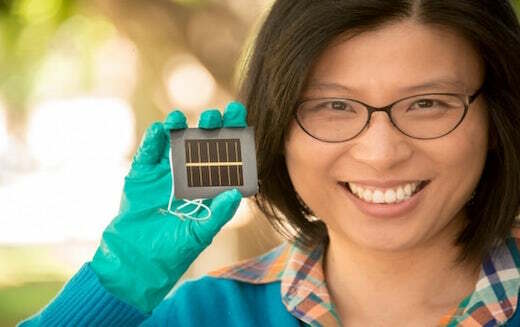 And now a team of researchers from the University of New South Wales (UNSW) in Sydney, Australia has made a breakthrough by creating the biggest perovskite solar cell so far, and setting a new efficiency record with it. 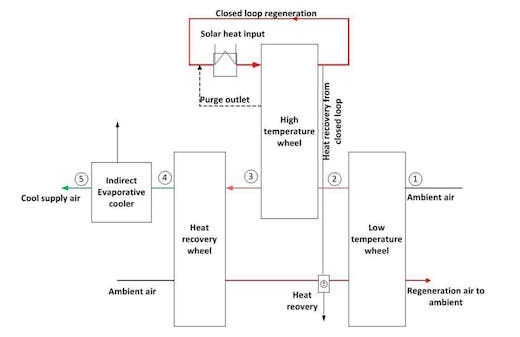 According to them, they have managed to achieve a 12.1 percent energy conversion efficiency rating for a 6.3 sq in (16 sq cm) perovskite solar cell. This cell is also about 10 times larger than any existing high-efficiency perovskite cell. The team also managed to achieve 18 percent efficiency for a 0.5 sq in (1.2 sq cm) single perovskite cell, as well as 11.5 percent for a 6.3 sq in (16 sq cm) four-cell perovskite mini-module. They are also confident that they can achieve a 24 percent efficiency within a year or so. These cells get their name from the crystals they are made of, which are grown into a structure called perovskite. Due to their special characteristic, such as the smooth layers of perovskite with large crystal grain sizes, these cells can absorb more light than solar cells made of silicon. They are also much cheaper to produce. Perovskite cells can also be created in different colors, or be transparent due to their chemical composition. This means that they can be used to cover virtually any surface, such as the sides or roofs of buildings, gadgets, cars and even windows. One of the major downsides of perovskite solar cells is the fact that they are not very durable. However, the team believes that they can also improve their durability as they strive for even higher levels of efficiency. 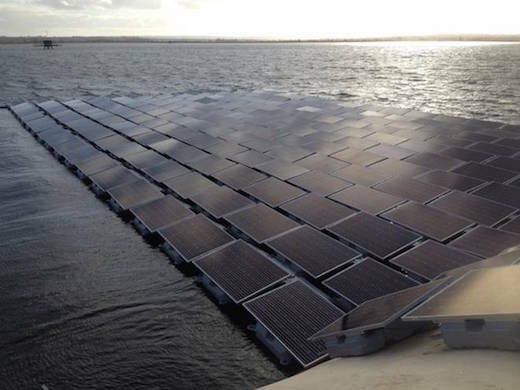 Following the example of Japan, which has already begun constructing numerous floating solar arrays to meet it’s renewable energy goals, UK’s Thames Water has now announced plans to do the same. They are already building what will be the largest floating solar array in Europe, and they plan to install it on a reservoir in London. This project is part of Thames Water’s goal of finding solutions to generate one third of its own energy from renewable sources by 2020. Placing a solar array onto a body of water is actually a very good idea for a number of reasons. Firstly, it is hard to obtain large areas of land where solar panels can be installed, especially in densely populated cities such as London. The second reason why placing them in water makes great sense is that the water can then be used to cool the panels, which makes them perform better and extends their lifespan. And placing them on reservoirs has the added benefit of blocking out sunlight and therefore inhibits algae growth in the water, while it also reduces loss of water through evaporation. The floating solar array in London will be constructed on the Queen Elizabeth II Reservoir, which is located near Walton-on-Thames. It will be comprised of 23,000 solar PV panels, which will be used to cover around one-tenth of the large body of water. To put in perspective, the covered area will be roughly the size of 8 football pitches. The capacity of the array will be 6.3 MW and it is estimated to generate 5.8 million kilowatt hours of energy in the first year. This would be enough energy to power around 1,800 households for a full year. The power generated by the array will be used to partially power the water treatment plant located near the reservoir. For more on SunPort, head to its Kickstarter page. 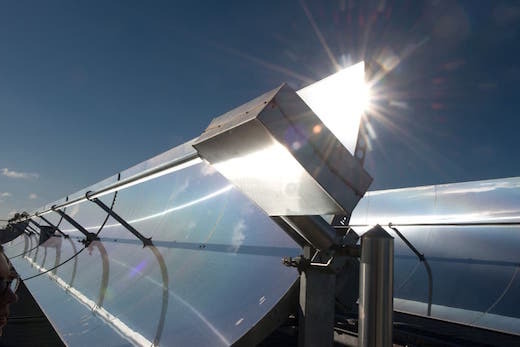 McLean, Va. – December 16, 2014 – Washington Gas Energy Systems, Inc., a subsidiary of WGL (NYSE: WGL) today announced the completion of 20 solar projects, totaling more than 15 megawatts, that will produce renewable energy for Georgia Power. The company held ribbon cutting ceremonies at their sites in Donalsonville and Richland, Ga. on Thursday, Dec. 11, and another event in Greenville, Ga. on Friday, Dec. 12. All of the solar arrays will be owned and operated by Washington Gas Energy Systems under 20-year Power Purchasing Agreements (PPAs) with Georgia Power. 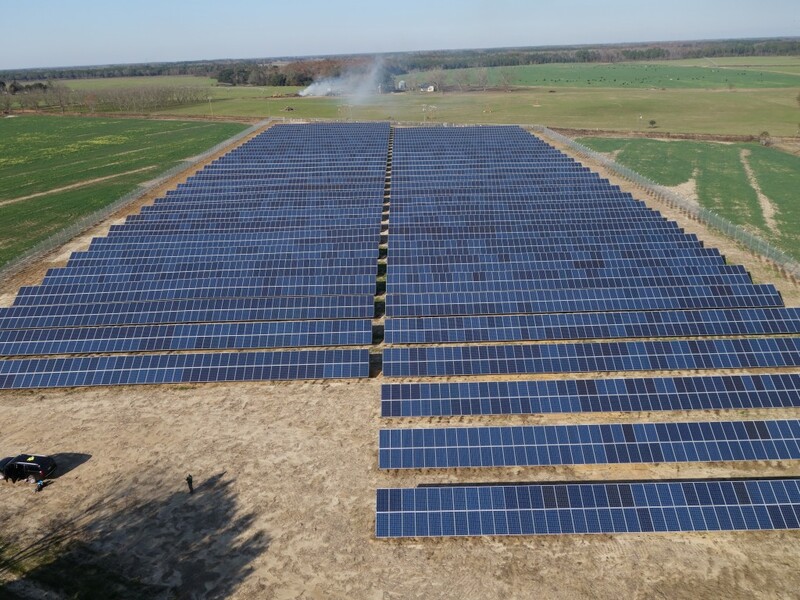 The project in Donalsonville is a 2-megawatt ground-mounted system composed of more than 6,000 solar panels, and is expected to produce more than 3,000-MW hours of electricity annually. 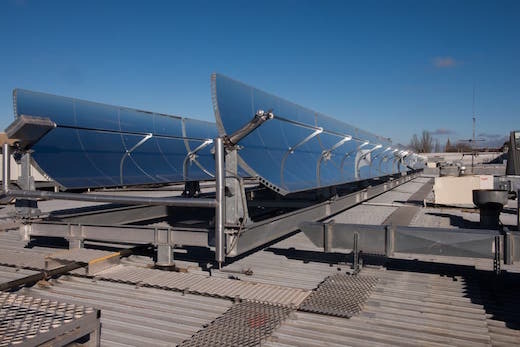 The project was developed by Office of Solar Development and all engineering, procurement and construction was performed by Cantsink Manufacturing. The Greenville project is a 1-megawatt ground-mounted solar away at the Meriwether County Industrial Development Authority. It is composed of more than 3,000 solar panels and expected to produce more than 1,500-MW hours of electricity per year. Engineering, procurement and construction was managed by Hannah Solar. In Richland, the 1-megawatt solar project consists of more than 7,000 solar panels and is expected to produce more than 1,500 megawatt hours of electricity per year. The project was developed by Inman Solar in collaboration with the City of Richland and the Richland Development Authority. Other Washington Gas Energy Systems projects under construction in Georgia include sites located in Montezuma and Homer, each sized at 1-megawatt. All projects are expected to be completed by February 2015.